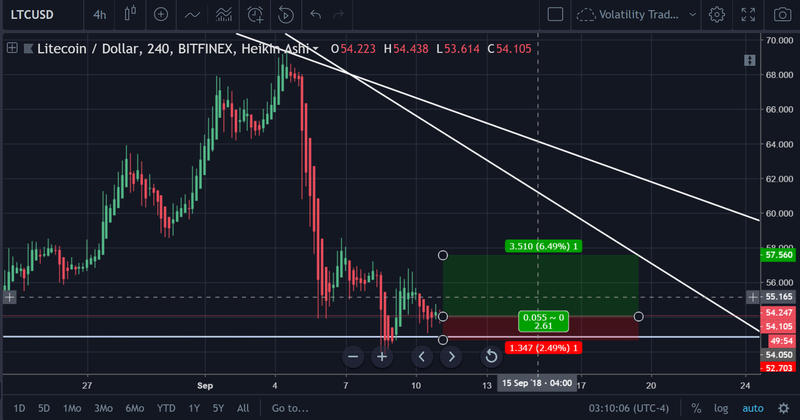 The price of Litecoin has been moving in tandem with Bitcoin (just with more volatility) lately, which makes it an especially juicy option for shorts/longs depending on which direction you think Bitcoin is going in (i.e., if you think Bitcoin is going long, you definitely want to long Litecoin; if you think it’s going to drop, you definitely want to short Litecoin). This is validated by the correlational index provided by SIFRdata. Rarely does this traded pair move opposite of Bitcoin, although there was a time where it was appreciating against Bitcoin at a fairly rapid rate a few weeks ago as Bitcoin was ascending in price (this was back in July). But without further ado, let’s get to it. 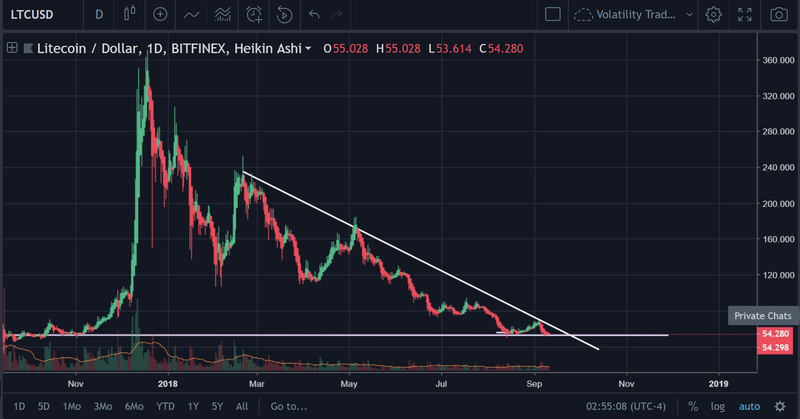 The white line that you see in the picture above represents the long-term support point for Litecoin. However, the RSI is signaling us out on the daily pretty hard. 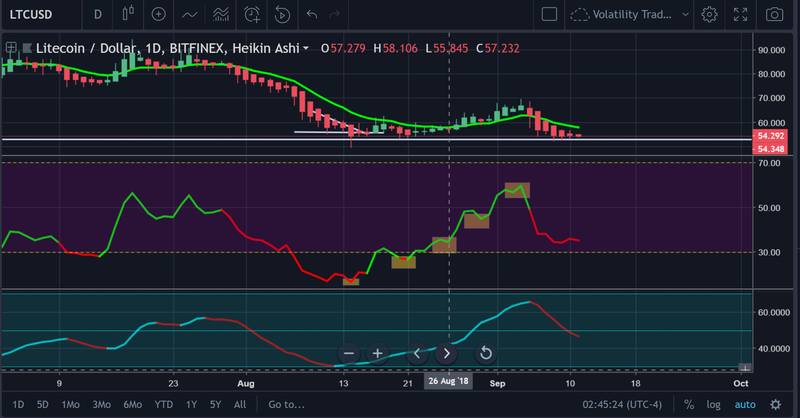 As you can see with the RSI, there was a sequence of highs that had initially occurred, that signaled we were in the clear with a good investment (solid upward price action). However, that elongated pattern of progress on the RSI(14) on the daily chart is now no longer. Yet, this long-term support point that we’re seeing (indicated by the white line), is holding tight thus far. Let’s check out the volume reading to see how that’s looking. 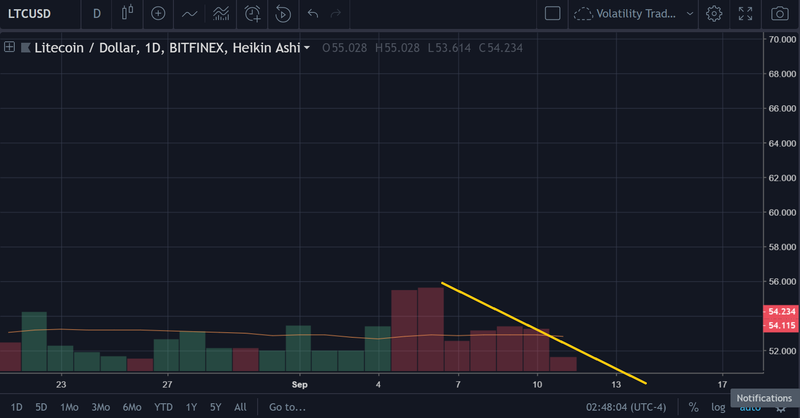 As you can see from the photo above, the sell volume has descended a bit over the past few days, but it still vastly outstrips the buy volume that preceded it. Normally, when there is a decrease in the volume, we can anticipate a price reversal. But this is not the case when we were in a bear market and that decrease is a decrease in sell volume. 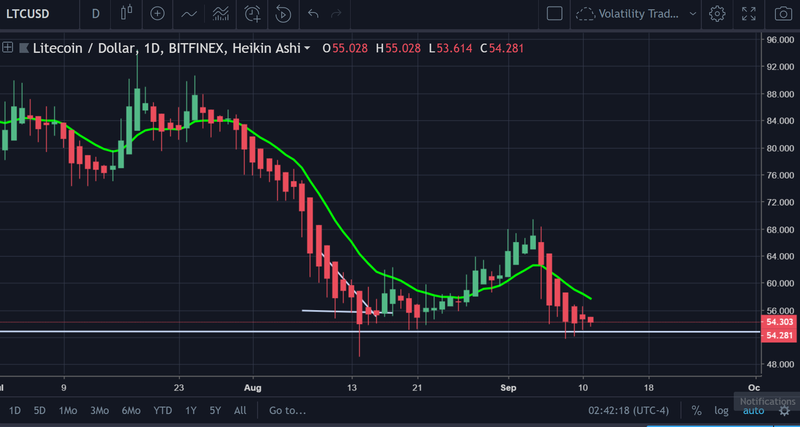 There is a chance that there could be a subsequent spike in sell volume, especially if the price of Litecoin falls back down through the the long-term support that its currently sitting at on the daily chart. 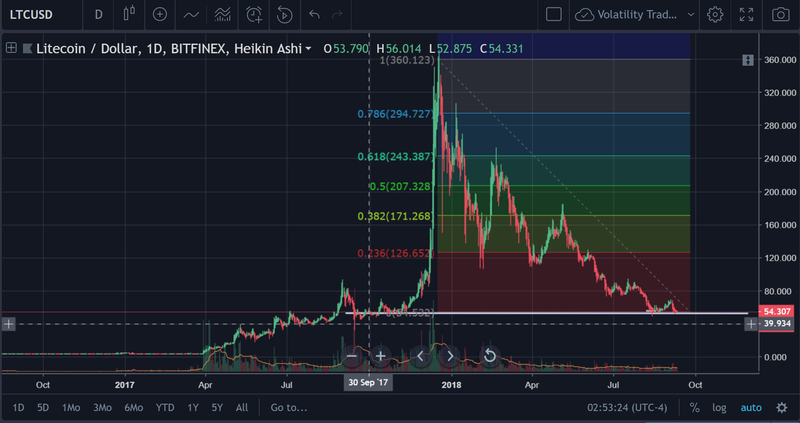 Let’s scroll out a bit first though, and get a better idea of why this long-term support is so important for determining the future price of Litecoin. 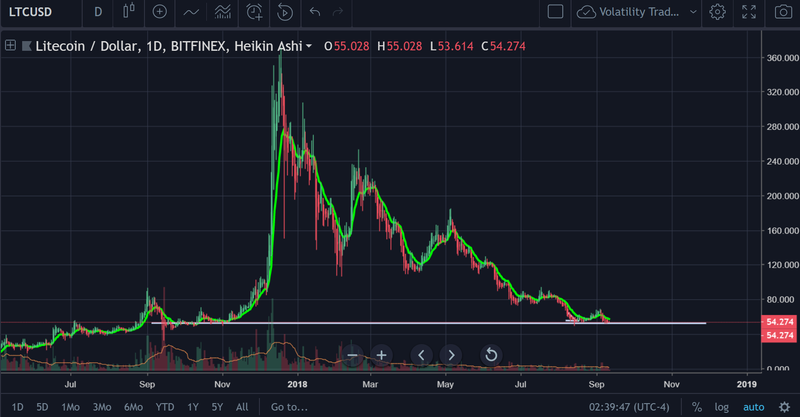 As you can see in the photo above, this long-term support is right where the price run for Litecoin really started up at in 2017. 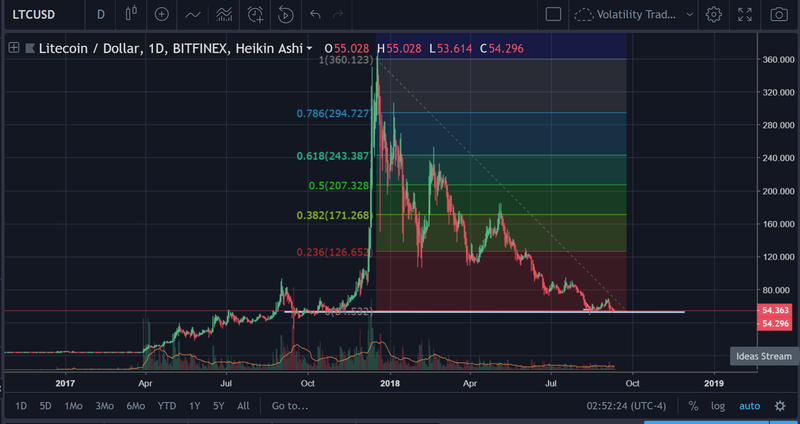 So, without even looking at a Fibonnaci chart, we can tell that the price of Litecoin is at a 100% retracement point on the daily chart. Above is the visual of the Fibonnaci though, in case you needed it. 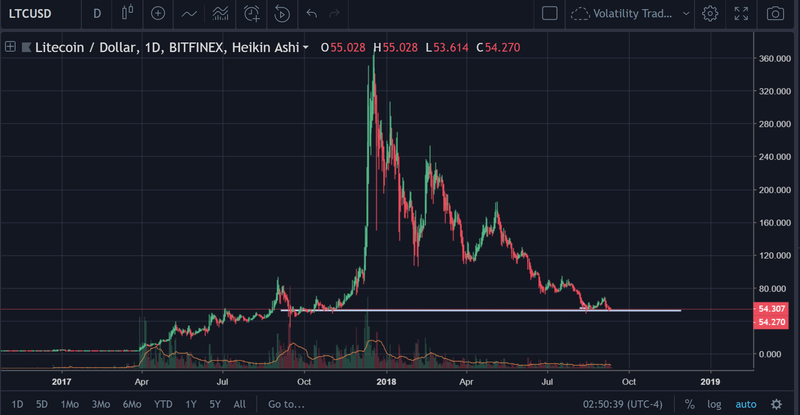 The next likely major support point is probably at $40-ish. 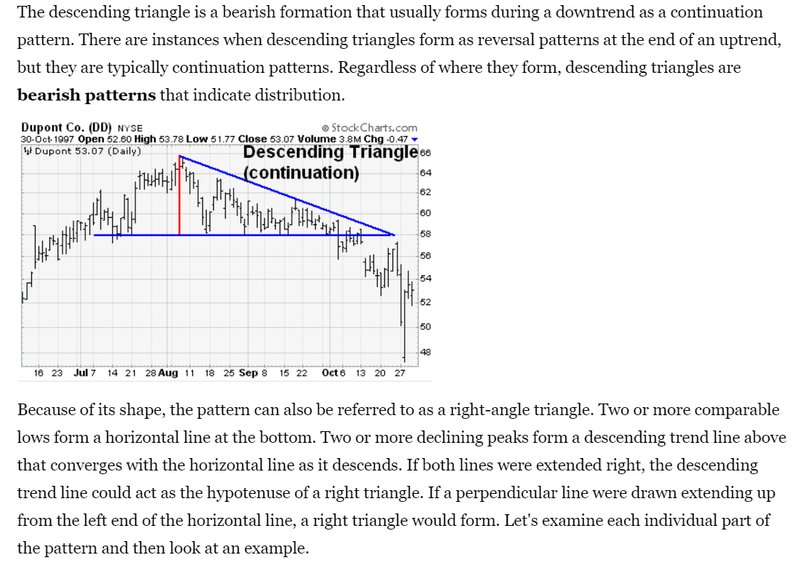 Triangle formation is nearing its apex on this chart. This can’t be called a descending triangle because it’s not. Everything you see above was posted specifically to emphasize the fact that this would not qualify as a descending triangle. Keep/save those excerpts specifically for your own edification. 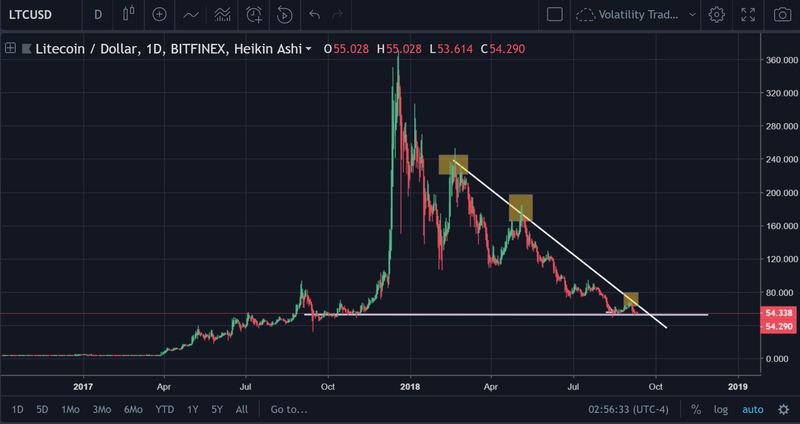 To conclude the long-term price analysis for Litecoin, the author is extremely bearish and sees another -20% drop, at the very least. 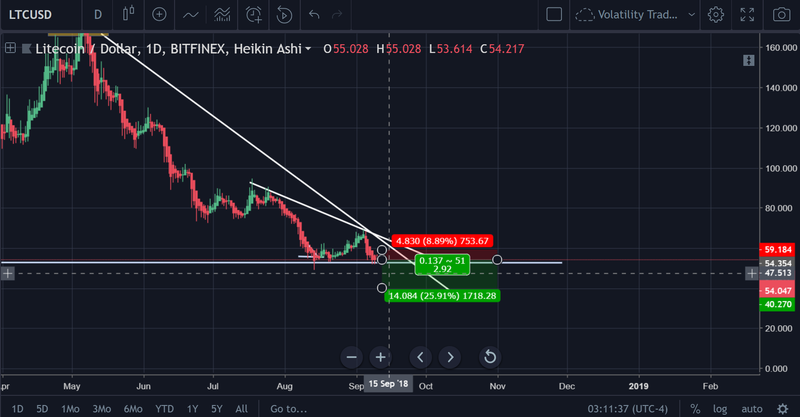 In the short-term the prospects for Litecoin look slightly more promising. 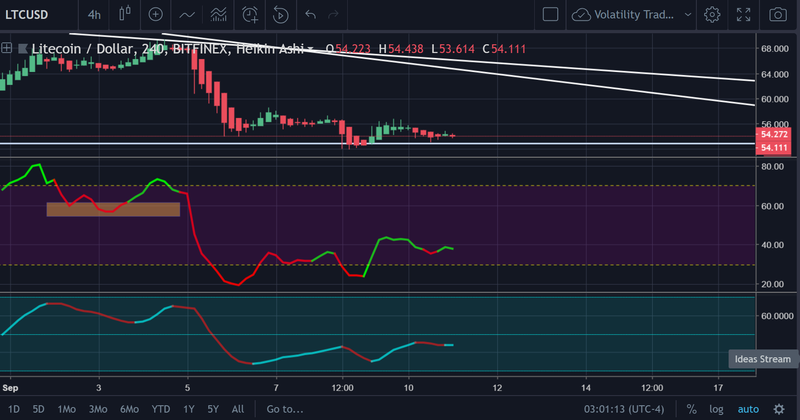 Divergence between the price and the RSI should be immediately apparent from first sight, but we’ll out line it below in case you weren’t able to identify it manually already. Basically, divergence is as simple as an indicator (like RSI for instance) moving in the opposite direction of the price. 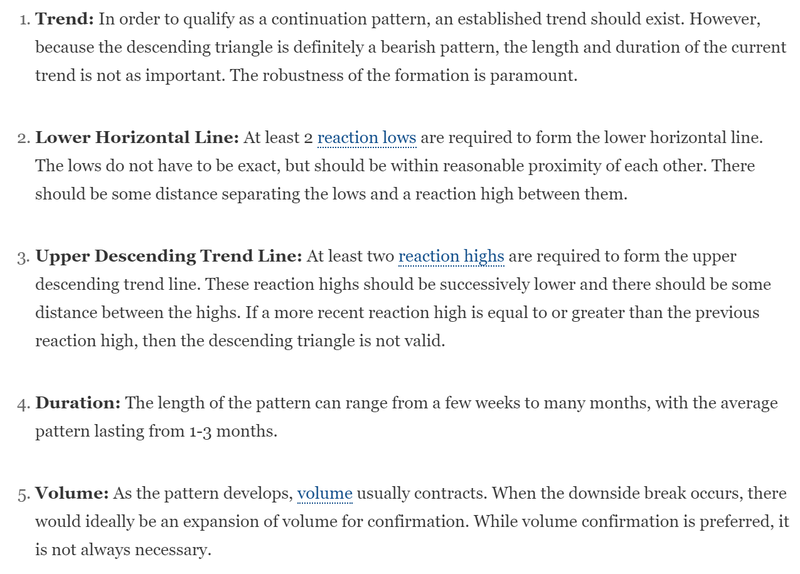 When the indicator is signaling bullish intent with the price acting in a bearish manner, that is considered positive divergence. 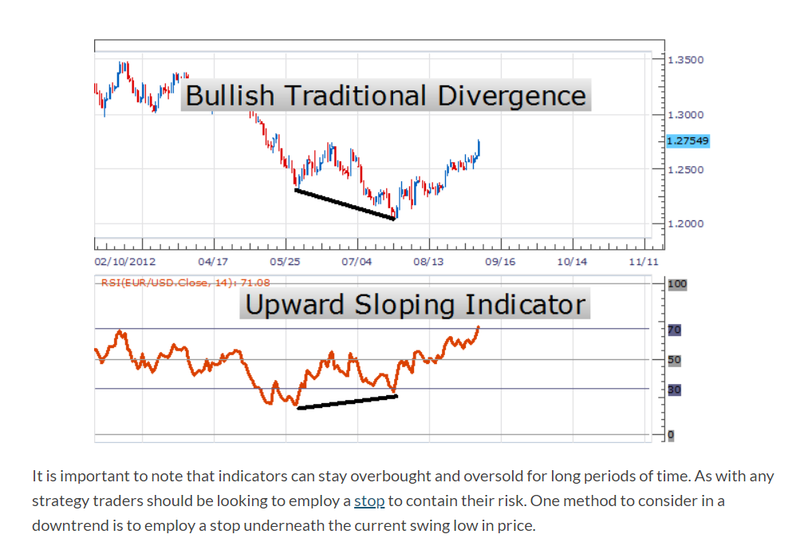 When the indicator is signaling bearish intent with the price acting in a bullish manner, that is considered negative divergence. Know the difference and learn how to identify each; it saves lives. 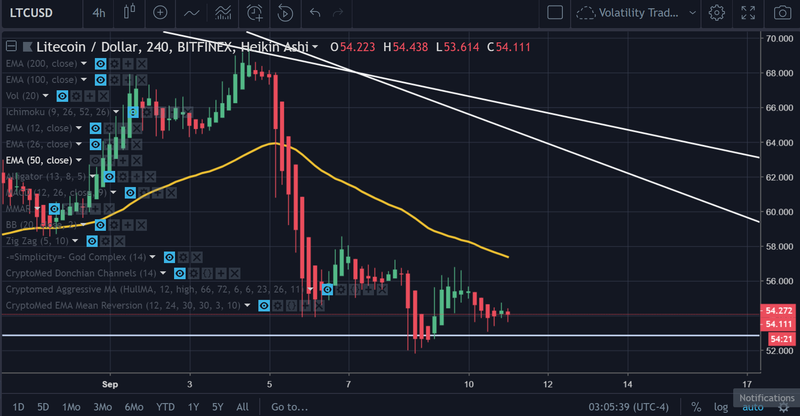 In the picture above, you can see we have the EMA-50 hanging right over the price of Litecoin on H4 currently at roughly $57. As noted in other analyses, the EMA-50 may perhaps be one of the most ‘powerful’ support/resistance points in all of crypto as far as EMA indicators are concerned, so this is definitely worth noting. The Ichimoku is dictating the same fate for Litecoin (assuming that it passes the conversion + base lines < — the two little red and blue lines on the chart right above the price). 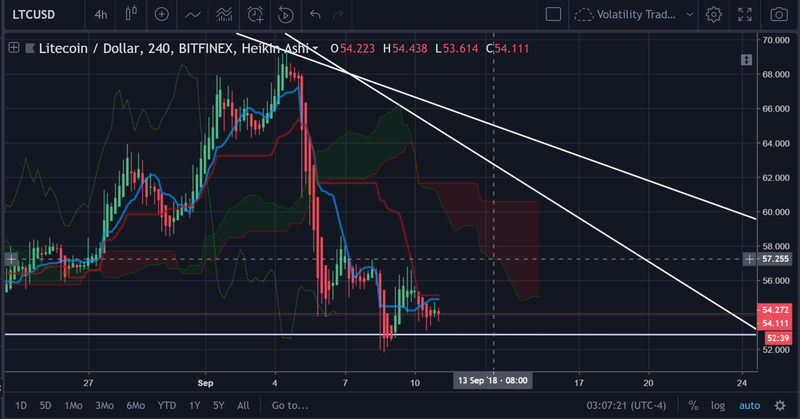 The bottom of the cloud is hovering at $57. So, $57 is looking like the definitive mark to beat. Given the bearishness of the daily outlook and the mild bullishness in the signals for the 4H chart, only the most mild of longs would be suggested here (even though it’s not advisable to risk tremendous losses scalping super short-term profits). If one were to attempt to short on Litecoin (probably the smartest decision), then it would be recommended that one set a S/L right above where the target was from the long position and then letting the price ride out from there. For this, we will change time frames and scroll back up to the daily. Truthfully, this is probably one of the more conservative outlooks for Litecoin, all things considered.